Funeral Directors and Embalmers in Delaware are required to complete 10 hours of continuing education every 2 years. The education is due by August 31st of even years. The Delaware Board of Funeral Services automatically accepts any course approved by the Academy of Professional Funeral Service Practice (APFSP). 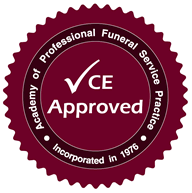 All of Funeral Service Academy’s courses are approved by the APFSP. Once you pass the exam online, you will be able to immediately download and print your completion certificate. This is the certificate that you will need for your records.